The tragedy in Nepal two weeks ago, where 40 trekkers, including four Israelis, lost their lives in a sudden freak snowstorm along the well-traveled Annapurna route brought back a flood of memories from my own trip to the Nepalese Himalayas. In 2011, my family and I went hiking in the same Annapurna region, and, although we didn’t navigate across the 5,400-meter high Thorong La Pass – which saw the brunt of the storm and most of the casualties when near zero visibility and sub zero temperatures shocked travelers who set out on what seemed an ordinary, October clear sky day – we trekked up to its end, threw snowballs, and spent a pleasant hour greeting the weary but exhilarated backpackers as they came through on their way to the bustling village of Muktinath, where we too spent the night. 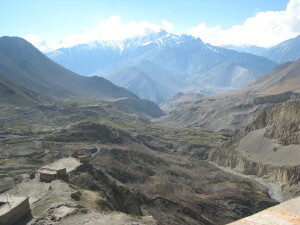 Muktinath – like much of the Annapurna Circuit – is filled with Israelis. Indeed, a Himalayan trek in Nepal, combined with a month in India and possibly time in Thailand too was, until supplanted somewhat in recent years by South America, considered the classic post-army trek for young Israelis. Even if you’re not trekking in a group with Israelis, there will be signs – literally – of the Holy Land everywhere: pieces of cardboard with hand scrawled Hebrew adorn restaurants and accommodations with recommendations only other Members of the Tribe can understand. We saw, for example, “great hamburger here,” and “comfy rooms at good prices,” all written right to left. In Muktinath, many Israelis congregate at the Bob Marley Guesthouse, a sprawling place with an enormous portrait of the reggae master welcoming visitors to its tens of rooms and chill lounge featuring a large pool table around which the dominant language is most definitely not Nepali. We didn’t stay there – our Nepalese guide recommended a more intimate place a few doors down – but we smiled as we peeked in and felt like we were already back home. To understand why there are so many trekkers – including all those Israelis – on the Annapurna Circuit, you need only appreciate some of the most stunning scenery in the world, which as one backpacker put it, “gets better every day.” You start by hiking through the low lands: lush forests filled with bright red rhododendron flowers in the spring, passing impossibly green rice terraces spider-webbing their way down the hills as you climb higher. Before long you are in a desolate alpine landscape, devoid of nearly all vegetation, vaguely Negev like but with more white and gray than brown, with the ever present peaks of the 7,500 meter Gangapurna and other Himalayan giants watching over travelers like a patron saint in hiking boots…until two weeks ago, when those same peaks turned into a death trap for far too many explorers, cut down at their most vulnerable, where the air was so thin. The stories from the surviving Israelis are as heart wrenching as the thinning atmosphere that sucked the life out of those caught in its midst. One tells of Nadav Shoham assisting Tamar Ariel who had expended her energy early on helping other hikers until she could no longer walk herself. Shoham lifted her up repeatedly as she toppled into the snow until he too had nothing left to give. Both perished. We were cold on our trek, too, but on nowhere the same scale and only at night if, as is inevitable for someone my age, one has to leave his or her sleeping bag to waddle outdoors to the squatter at the end of the hall. The frequency of guesthouses means you don’t have to lug camping gear or food. If you hire a porter – and at $10 a day, who wouldn’t – you don’t even have to carry your own pack, just some water and snacks. The guesthouses – which you can’t pre-book, it’s all first come first serve in the Himalayas – are what I’d call a Motel 6…minus 5. The rooms – if you can call them that – consist of a bed with a mattress of varying degrees of hardness and four walls but with absolutely no insulation and often windows that are either cracked or ill fitting. You’re not sleeping under the stars, but you can still see your breath at night. It makes an Israeli field school look like a 5-star palace. But the teahouses were no guarantee against the storm that hit Annapurna. One Israeli trekker tells how she left her friends behind at a teahouse near the summit. (Her guide insisted they try to make it to the other side, despite the worsening weather; it saved her life.) At 2 pm, the teahouse owner decided to evacuate his property and escape. He promised to guide the trekkers to safety but, of the 30-odd people who followed him out, only a handful arrived safely at the nearest village many hours later. Our trip to Nepal in 2011 – three weeks in total with eleven days on the trail including two rest days for Shabbat – was conceived as a way to celebrate my 50th birthday and our youngest son’s bar mitzvah. We did the “half circuit,” hiking in the opposite direction, giving the pass a pass, and flying back from the tiny airport at Jomson. I used to joke that our biggest accomplishment was that we spent all that time together, 24/7, three meals a day, and we didn’t kill each other. In light of recent events, that seems like inappropriate black humor. Among those providing assistance to trekkers who made it out of Annapurna alive was Nepal’s strong Chabad, which has two main houses in Nepal – the main center in Kathmandu and an outpost in Pokhara, which is the jumping off point for the Annapurna region. At this time of year, Chabad was still bustling with backpackers who spent the High Holy Days in Nepal. We had our own Chabad experience – we went trekking in the spring and celebrated Passover with the group. That was part of the draw for me – Kathmandu’s Seder is known as the world’s largest although, in 2011, there were “only” 1,100 Israelis present at the Yak and Yeti Hotel, chosen not for its whimsical name but for the fact that, in electricity rationed Kathmandu, the Yak and Yeti had its own generators, meaning we would be less likely to be plunged into darkness at the height of the recitation of the Ten Plagues. Throughout our trip to Nepal, when the weather was warm and the sights too striking to conceive of being consigned to a perfunctory photo album, I imagined I might return someday to do the full circuit, maybe for a 60th birthday challenge. After what happened earlier this month, would I still entertain the possibility? While the Annapurna trail was, at press time, still closed to trekkers, as rescue workers continued to search for bodies, it will no doubt open again in the spring and the intrepid will return. Disaster can strike at any time, anywhere. Would I avoid Phuket and the beaches in Thailand that were decimated by the 2004 earthquake and tsunami? Should New York City become off limits because of Hurricane Sandy (or more human made catastrophes like 9/11)? My heart cries out for the casualties and suffering of the Annapurna tragedy – all the more so because, like so many Israelis, I can see the trails and remember my own slowing pace as we hiked ever upwards. Perhaps I would hike earlier in the year to be extra careful. But if I’ve learned anything from living in the Middle East these past 20 years, it’s that we move on and do our best to live our lives “normally.” That applies in Jerusalem, and it does so in Jomsom as well. I first shared my Nepal memories over at The Jerusalem Post. Next post: Hillel vs. Shamai or When is it OK to Tell Your Wife’s Friend She Looks Fabulous?